When she was still little, Elvira’s dad went off to fight in World War II. She reckoned it was her fault he left. His ship blew up the first week out and he never came back. That must have been her fault, too. Now Elvira’s stuck in their tiny house set in the big middle of nowhere with her mother, grandmother, and the sister her father never knew. Jessie—Elvira’s little sister—is, well, odd. She didn’t talk until she was four years old and then her first word was a cuss word nobody in the house used. How did she learn that? But that’s nothing to what happened when the junk man stopped by. Turns out Jessie is a “seer” with the gift of knowing things she shouldn’t, couldn’t know. That’s a big burden for a little girl, and one more cross for Elvira to bear. She already has to put up with a self-centered mother and bitter grandmother who barely notice her unless it’s to snap her head off. Add in a load of guilt over her father’s death and the responsibility of caring for Jessie—the adults are too busy fighting to bother—and it’s not exactly a happy childhood. Still, when that life is threatened, Jessie clings to her hardscrabble, anger-ridden home life. Nevertheless, a mysterious journey is required. Fortunately for Jessie, it’s ultimately a journey toward redemption and healing. 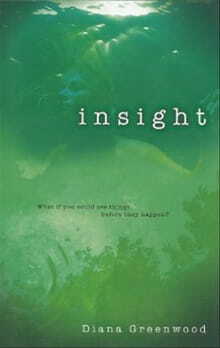 Insight, Diana Greenwood’s debut novel for young adults, has a wonderful period feel to it. When Elvira’s mother packs up the family and latches onto a travelling preacher for a cross-country trip, it’s like reading a gentler version of Grapes of Wrath. No one in Elvira’s family believes what the preacher is pushing, but he’s a nice man who’s willing to take them where they want to go. He really is a nice man, too, with a genuine faith and determination to do what God has called him to do. Jessie may be a seer, but she doesn’t necessarily foresee God’s plan for her family. That won’t stop him from putting it into action, of course, even if it takes a camp meeting, a stray dog, and a near-death experience to make it happen.